Top Gear has concluded with the lowest audience of its current series, as viewers flocked to watch Euro 2016. An average 1.9m viewers watched Sunday night's episode of the motoring show - 8.6% of the available audience. ITV attracted the biggest audience of the night, as an average 6.6 million viewers tuned in to see France's 5-2 win over Iceland in Euro 2016. BBC One's Antiques Roadshow, which also overlapped with Top Gear, was watched by an average of 3.9 million. The overnight figures measure how many viewers tuned in to the live broadcast - and do not take into account those who have watched the show on catch-up services such as iPlayer. Audience data suggests viewers tend to watch live events such as sports matches as they are being broadcast, whereas entertainment programmes can often pick up extra viewers via on-demand services. Top Gear: Do overnight TV ratings matter? Sunday evening's Top Gear was about 800,000 down on last week's average of 2.7m - and just over half the number that watched the series launch. The episode received lukewarm reviews, but some critics said the show had improved over the course of the series. Digital Spy said: "Instead of an episode which was about 10% enjoyable like the premiere, they're now up to about 60%." "When the right people - Matt LeBlanc, Rory Reid, Chris Harris and Sabine Schmitz - are front and centre, there are moments where Top Gear feels like it has found its feet." The new series was the first since the departure of Jeremy Clarkson, Richard Hammond and James May. The trio exited the programme after Jeremy Clarkson punched a producer. Chris Evans and Matt LeBlanc were later signed up to front the show. Writing in The Telegraph, Amy Blumson said: "The presenting team need time to bond, and those new to the studio were just warming up as the series came to a close." "The new Top Gear series has shown glimmers of promise, but like the nippy Porsche 911 R in the final episode, they often disappeared over the horizon as soon as Chris Evans starts shouting." The Guardian's Stuart Heritage said: "Despite the personnel changes, Top Gear remains a beautiful television programme to look at." 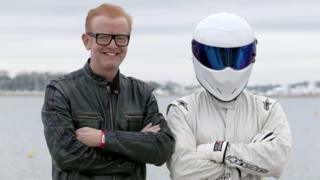 But, he suggested, some elements of the show such as The Stig and the celebrity interviews should be abandoned. Top Gear: How much do overnight TV ratings matter?